Sweet Home Adult Day Care LLC has established itself as one of the greatest and prestigious providers of Adult Care Center in Southwest Florida. We were established in 2012 and ever since then, we have created a great environment for our residents. Our mission is to provide quality care and support, creating a happy environment to help maintain a healthy body, mind and spirit – “THAT’S OUR GOAL”. We are a beautiful and professional facility for our elderly population, and also special needs people. We want them to come and enjoy their lives despite their old age, disability, and/or other limitations. Our staff at Sweet Home Adult Day Care LLC is very friendly and caring. We truly care for our residents and we do our best to make them feel at home. No matter how bad our resident’s day was, we make sure to always have a smile ready for them. Our staff also participates and interacts with every resident so that they won’t feel uncomfortable or rejected by anyone. Whatever our residents need, we make sure to provide it because “It’s all about them”. If they are happy, we are happy. And that’s important for us and their families too. Our facility has many spaces for them to feel comfortable. We have a Movie Theater Room, a Computer Room, and what makes us different is that we have a lovely Beauty Salon ready for them to use whenever they want to. Our center also has one-hour daily motivation classes such as Zumba, Seniors Stretch, Strong Minds, Seniors Twist, and every Friday, we have music and karaoke day. We have qualified instructions who can teach them step-by-step so that they can participate and enjoy that time of relaxation. Our residents can enjoy these one hour-classes and we all have a great time with them. We also provide 2 meals and 1 snack every day from Monday to Friday. 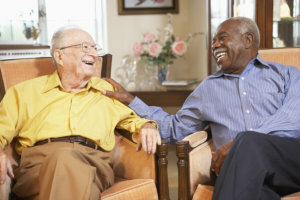 At Sweet Home Adult Day Care LLC, we accept residents aged 18 years old and above that might have disabilities or conditions such as Alzheimer’s disease, wheelchair disability, Down syndrome, Dementia, retired veterans with disabling conditions, and etc. If you would like to learn more about who we are and what we do, feel free to contact us at 239-491-9329 for more information.